Background: Early under-nutrition not only hampers physical growth but also adversely affects cognitive growth of children. Hence, appropriate complementary feeding practices are crucial for the proper growth of children. The study was aimed to find the association of mothers’ sociodemographic characteristics with their knowledge and practices about complementary feeding. 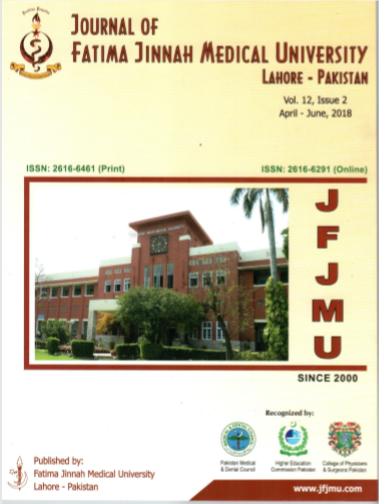 Subjects and methods: The cross sectional analytical study was carried out at preventive pediatric department of Sir Ganga Ram Hospital Lahore from November to December 2016. Interviews of 148 mothers were conducted to collect data. Data was analyzed by using Statistical Package for Social Sciences version 20. Results: The mean age of mothers was 27±5 years; average family income was 21,000 PKR/month; 81% received formal school education; and 7% were doing job. Only 47% mothers had adequate knowledge of complementary feeding; and only 23% mothers had appropriate feeding practices. The mothers who received antenatal care and counseling (OR=2.906); and those who were doing job (OR=4.903) had higher odds and showed significant association with appropriate knowledge (p<0.05). The mothers who were literate (OR=3.231) or who had age ≥35 years (OR=2.400) had higher odds for appropriate practices. Mothers who received antenatal care; delivered within hospital; and those who were literate showed significant association with appropriate practices (p<0.05). Conclusion: Both, knowledge and practices regarding complementary feeding were inappropriate. Seeking antenatal care and counseling, and delivery within a hospital had significant association with appropriate knowledge and practices. Proper counseling and awareness of mothers to adhere with appropriate child feeding practices is highly recommended.